Interactive wall with over 100 interconnected devices at Hartsfield Airport, Atlanta invited people to create animations while demonstrating Box mobility. It resulted in over 1.1 million interactions. Mobile Digital billboards put a spin on taglines of potential customers like Coke and parked outside their headquarters in Atlanta. Home Depot were so flattered by the personalized messaging, their CIO called our sales team for a meeting which led to an account win. Billboards were highly contextual. This billboard in Atlanta was placed in a not so safe neighborhood. Billboard right after exiting the airport. Billboard placed near a hospital to speak to the healthcare industry. The story of the Dam Keeper—a short animation side project between animators at Pixar—was how friendship can get you through any kind of adversity. In the film, a fox saves his bullied friend, the pig. The parallel was that the two directors also had to fight the odds against budgets, a full time day job and the frustration of working with 85 film makers and animators from all over the world. Box made it possible. 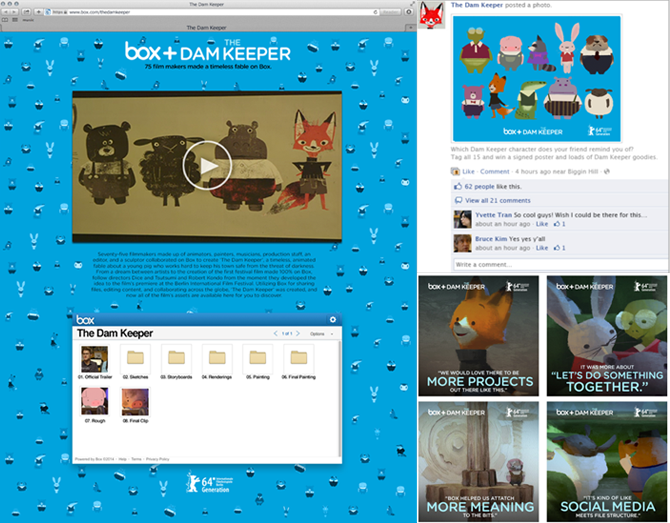 The Dam Keeper was nominated for an Oscar in 2015. For Box Notes, the insight was there's this waste of intellect from people losing ideas that never had a good way to get captured. The thought: Never Let the Best Ideas Get Away. The Box Notes video was featured on 25 blogs, including Techcrunch, Wired, The Verge that aided a successful product launch. Box went successfully won over Wall Street in Jan 2015. It was the first tech IPO of the year and gave the confidence to all the companies that new ideas that are disrupting the old ways of doing things are here to stay. It was fun and intoxicating to be part of this rebrand experience.